With the deadline day underway, clubs are intent on making swift and vital signings, with top European teams facing the headache of trying to replace lost talent. Borussia Dortmund, however, seem to have been able to do just that, by signing a replacement for Ousmane Dembélé, who just last week, departed for Barcelona. The German club’s official twitter account revealed the signing as Manchester City youth academy product Jadon Sancho, who had emerged as a target for Arsenal in the past few weeks. The deal is believed to be worth about £10 million, including a sell-on clause. The English teen, who is merely 17 years old, will occupy the No.7 shirt left behind by Dembélé – another youngster to have just completed his teenage years. 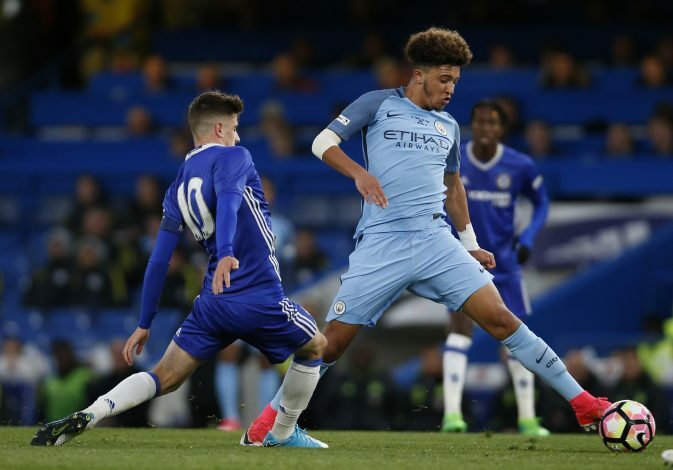 Sancho functions as a winger and an attacking midfielder, and gained prominence amongst the Mancunian youth academy. However, after having given no chance to break into the senior team as well as being dropped out of the team’s pre-season squad to the USA, he decided to force a move. In another parallel to the Frenchman who he will be replacing, the youngster achieved the move by missing out on training sessions for the English side, citing illness as his reason. This had provided hope for Arsenal, who have been keenly observing the emerging talent. However, reports suggest that City only allowed the player to negotiate with foreign clubs over a potential switch. Elsewhere in London, even Tottenham were hoping to secure his services, and a move to the capital was reportedly hinted at through the player’s social media. Supporters believed that his friendship with Reiss Nelson would sway him towards joining the Gunners instead, which wasn’t to be. Dortmund will be happy with this signing, as he has been described ‘amongst the top emerging talents in Europe’ – the kind of title the likes of Mbappe and Dembele received in the past as well. Will this move mark a swift session with the German side that will act as a gateway season to a big money move elsewhere? Time will tell.